Buffets have often been referred to as "a melting pot of flavors and types of food" influenced by many things. 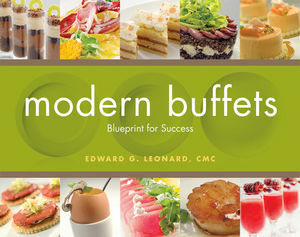 Modern Buffets: Blueprint for Success offers students inspiration, recipes, and ideas to advance the craft of buffets to a more modern place. The recipes featured in this text offer modern interpretations of classic recipes with contemporary presentations and new dishes. This text can be used as a resource in buffets, catering, and garde manger courses or by industry professionals to learn about buffet service and menus, as well as to develop presentation concepts and ideas. More than 100 beautiful color photos show completed buffet presentations, which can be used as models or inspiration for buffet presentations. In addition, blueprint drawings help demonstrate how to properly set up the displays for successful presentations. Modern Buffets: Blueprint for Success focuses on methodology and recipes to ensure students understand what it takes to execute successful buffets in today's culinary environment. Edward G. Leonard, CMC, is Executive Chef at Westchester Country Club. He is formerly the president of the American Culinary Federation and is one of only 72 Certified Master Chefs worldwide. Chapter 1: Evolution and Methodology of Buffets. Chapter 3: Lunches for All Occasions. Chapter 4: Composition of Flavorful Salads with Impact. Chapter 5: Dinners with Flair. Chapter 6: Elegant Finger Foods. Chapter 7: From the Glass. Chapter 8: Small Plates, Big Flavors. Chapter 9: The Art & Taste of Pastry. Chapter 10: Old Buffet Favorites Made Elegant. Chapter 11: The Dine Around Concepts to Reality. Chapter 12: Working the Canvas. Chapter 13: Menu Concepts & Accentuating Ideas. Chapter 14: Where to Buy What You See. Chapter 15: From the Chef's Pantry--Recipes to Inspire and Build Upon.